When Freddie is given an ancient map it opens the door to a world of adventures. With help from his friend, Freddie embarks on a journey through time and space, finding himself caught up in a story from mountaineering legend. An exhilarating page-turner encompassing history, action and adventure in abundance! A well-loved British actor, with parts varying from Thomas the Tank Engine voice overs, to doctor Mike Barrett in BBC’s Holby City, to Greatjon Umber in Game of Thrones! Clive Mantle now turns his talent to writing! Clive’s inspiration came during a charity trek to the Mount Everest Base Camp. A wonderful read. Brilliant characters and educational without being patronizing. I really hope there are more Freddie Malone adventures to look forward to. Great story for the young and the ‘young at heart’ . Loved the characters and became totally engrossed in the thrilling adventure that befell Freddie. Looking forward to the next book. Hope I don’t have to wait too long. I was so lost in the adventure I forgot I’d bought it for my nephew! So, we bought another one. Fabulous story and I so look forward to the next one – or two! I brought this although aimed at the young, but I started to read it and really enjoyed the book. It would appeal to anyone who likes a good yarn. Loved this story from start to finish. A huge fan of the Everest story and the Mallory mystery, so was thrilled that Clive brought it to the attention of a new generation. A gripping, well-crafted read. I read this magical book before embarking on a trek to AmaDablam BC…..Freddie travelled with me all the way to Namche Bazzar. My nephew adored it. A wonderful adventure story which is captivating from start to finish. It is a joy to read and a joy to share with readers of all ages from eight to adulthood. I thoroughly enjoyed it, super-highly recommend it and I can’t wait to read Freddie’s further adventures in books two and three in the series. Superb! It had me enthralled—-I don’t know about the kids! This is a super adventure that anyone of any age can enjoy. Brought a lump to my throat. A great adventure, very moving too – enjoyed by kids and adults in our house! I bought this book for my nephew and ended up keeping it myself and buying him another one! I found it totally absorbing. Loved the mixture of fiction and fact. Waiting patiently for the next one, Clive. Amazing first book … can’t wait for the next one! Pick it up and can’t put it down. Hope there is a other soon. A super book which was really enjoyed by our children, we read it ourselves, and we loved it too. It reminded myself and my husband of the wonderful adventure stories which we read when we were children. As well as a wonderful central character and story, we were thrilled to see how much our children learned about Nepal and Everest and it sparked a real interest in them to read more about Nepal and the Everest expeditions. And they have. Nepal became their chosen subject for their geography projects at school and it was a novel choice, leading other children to want to discover more too. They all learned so much. Very, very happy children, Mum and Dad, and teachers. We all look forward to the second book in the series. Bravo Clive Mantle. Great read. Definitely give it a go! Read it with great joy – time spent away from the everyday worries of the world – not an easy thing to achieve – please let there be more – oh, and my nephew loved it too! 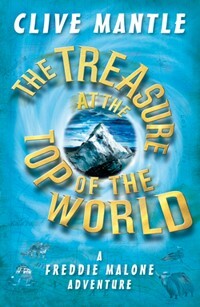 There’s Treasure At The Top Of The World and there’s treasure in this book. A real adventure yarn for all ages. Great fun. Absolutely loved this book, fabulously written and researched. And Clive is such a lovely lovely man. Super read, hooked from the start. My daughter “loves the bit that he waves to people but has his broken socks on all the time”. Congratulations of an excellent book. Freddie Malone is a wonderfully imagined, relatable hero, and the writing marvellously evocative and absorbing. If there’d been a series of ‘Freddie’ books when I was a boy, I’d have devoured them: as it is, the defiantly ungrown-up me is delighted to have found this marvellous new writer; let’s hope this is just the beginning of a long run of imagination-sparking stories. Hats off to Clive Mantle! Brilliant, stirring stuff. A real rip-snorter! A great read. Have shared it with my friends. They agree. We have a new hero in our mist it seems. So excited for this author who has moved his love of story telling from one form to another. This will definitely be a birthday gift for our grandsons! A brilliant read. Totally loved it. Kept me amused. Lol. An intelligent read, a wonderful adventure with loveable characters. Suitable for readers of any age. What becomes apparent through Clive Mantle’s writing is that he has deployed the same skills that have served him so well as an actor. He seeks to reveal character by every means possible – from action to reflection, thoughts to words, relationships to events. Most of us would settle for a single career – but he’s now gone and produced a remarkable book – and this at his first attempt. It’s enough to make the rest of us sit and sulk… but that’s something that Freddie Malone would never allow. Bravo, Clive, thrice bravo! An excellent read that made me want to visit Everest! Real pacey, modern page-turner of a book that I was sad to finally reach the end of. Look forward to what Freddie (and Clive) come up with next! Clive writes with such joy and genuine love of his characters (even the not-so-pleasant ones) that it’s impossible not to be drawn in. And how wonderful to find an adventure story, a genre that is so underserved. Well done, Clive – jus’ like that! Great read – definitely not just a kids book, loved it. An outstanding debut. What a great read. Very accomplished …. A lovely read! Congratulations, Clive. Bought this for my 9 year old nephew and he absolutely LOVED it!!! Now I’m going to nick it off him and read it myself!!! Loving your work (as always) Mr Mantle!!! Great stuff; a real page turner. She’s a slow reader normally, but my daughter finished this within a couple of days. She says she enjoyed it as much as Harry Potter! Breaks the generation gaps between parents/children. Brings us back to the days where life was full of adventure as we walk through this story with our kids. I’ve loved this man now as an actor but even more so as a Writer. Literature has always been a first love of mine. I really enjoyed Clive’s book especially the colourful characters and found great similarities between myself and Connor. The birthday party was a hoot and Clive’s descriptions allow your mind to run riot. The book touches on bullying and is handled extremely well. Congratulations Clive looking forward to more colourful adventures!